Altocumulus virga is a type of clouds which are categorized as middle altitude clouds. This means that when compared to other types of clouds, altocumulus virga normally occur at an average distance above sea level. The distance between the sea level and the base of altocumulus virga is normally around 6,000 to 16,000 feet above sea level. One characteristic feature of altocumulus virga is that they can bear some sort of precipitation such as rain or snow. However, there are many times when the precipitation from altocumulus virga doesn't reach the ground, so its not always constant that altocumulus virga presence means that there's going to be rain or snow. What height are altocumulus virga clouds found? These clouds are usually formed at a height of 6,000 feet to 16,000 feet above sea level. Since a few planes may fly at this height for some reason, these clouds pose a significant risk to many pilots, and that’s why it’s important to learn about them. Based on the altitude at which they form, the altocumulus virga can be classified as middle level clouds. This is because they form at an altitude of between 6,000 and 16,000 feet. How are altocumulus virga clouds formed? Air meeting a mountain as it’s moving. The mountain forces the air to move upward toward cooler regions above. The air could be forced to move upward by convectional currents. Air could be forced upward when it comes into contact with cold air. In the case of altocumulus virga clouds, all the condensation happens at an altitude of around 6,000 to 16,000 feet, and this is why these clouds form at that height. What do altocumulus virga clouds look like? Altocumulus virga clouds normally have wisps of clouds which trail down from the main body and base of the clouds towards the ground. 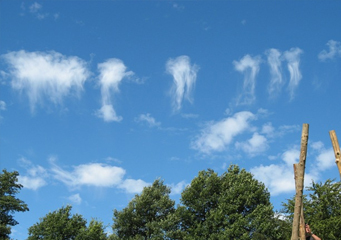 The term virga is used to describe the fact that some of the precipitation in these clouds normally falls from the clouds but doesn’t reach the ground, causing formation of the wisps. How common are altocumulus virga clouds? Altocumulus virga clouds can be very commonly seen in areas that experience a moderate amount of humidity. However, the fact about altocumulus virga clouds is that they can form and dissipate very fast, so one always needs to be on their toes if they expect to see the clouds. Where can I see altocumulus virga clouds? Altocumulus virga clouds can be seen in many temperate zones of the world. For instance, they can be seen over most of the southern states of the US, as well as some regions in the UK and surrounding areas of Europe.